The Tinkering Kit will have boys and girls, moms and dads all clamoring for their turn to build a robot that does more than merely walk. Challenge cards urge kids to make a machine to scramble an egg or build a robot that moves without wheels. Robotics teaches science, technology, engineering, art and mathematics, also known as STEAM learning. Computer programming is the last step (TinkeringLabs.com/catalyst). Benedict Beckeld, Ph.D., of New York City, speaks 11 languages, and teaches students via online video chats (Skype) (BenedictBeckeld.com/contact). Locally, find teachers or grad students to tutor a second or third language at home for the whole family. Search online for interactive, game-like classes that maintain a child’s interest. American Sign Language, the fourth-most used language in the U.S, is fun to learn and helpful to know. Take a quiz, experiment, learn more and find kid-approved recipes at AmericasTestKitchen.com/kids/home. Kids learn to make siracha-lime popcorn, hummus, and chicken and broccoli stir fry. Use organic and non-GMO (not genetically modified) ingredients. Sign up to receive recipes and tips for hands-on activities via email to keep good meals coming. The onsite equipment reviews help with selection of affordable and safe kitchen tools. Carolyn Dube, a mixed-media art adventurer in Batesville, Indiana, gives her followers at AColorfulJourney.com permission to play and even make mistakes. “My free online workshop shows ways to use found items like recycled cardboard to make art,” she says. 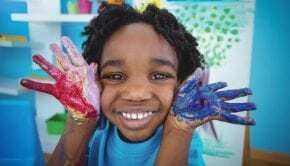 For kid-safe paints, look for the Art and Creative Materials Institute, Inc. (AMCI) seal that certifies products are non-toxic and properly labeled. Certified Arteza brand acrylic premium paints are packaged in less-waste pouches to use as-is or to refill original containers. The Danish company, Sprout Pencils, operating from Boston, Massachusetts, engraves quotes on biodegradable Love Pencils, which contain flower or vegetable seeds. When it’s too short to write or color with, plant it. In Cleveland, Faber-Castell USA makes their colored pencils from re-forested wood with an ergonomic, triangular shape, perfect for learning the proper grip. The Young Artist Essentials Gift Set contains eco-pencils, non-toxic crayons and oil-pastels. Gifts that engage the mind, spark imagination and deliver fun are gifts that yield immediate and long-term benefits, including being fondly remembered. What Do You See on Chanukah? is a board book for toddlers by Bracha Goetz.